A weekly web series created by PBS Digitial Studios called The Art Assignment has lately taken on the daunting and noble challenge of defending the work of controversial artists whose very names elicit exaggerated eye rolls and audible groans of disgust. So far, there have been episodes devoted to Mark Rothko, Andy Warhol, and Kanye West. Tough cases all. The fourth such installment, however, might be the trickiest yet as the series takes on “The Case For Yoko Ono.” That very title will likely inspire widespread skepticism and derision, but narrator and project curator Sarah Green is dead serious about this and makes a sensible, evidence-based argument for Ono’s conceptual art, music, and political activism. 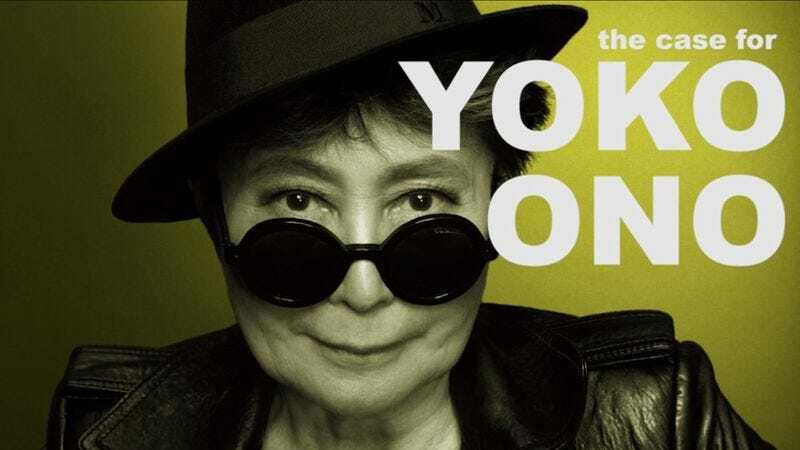 Though most people associate Ono with her late husband, John Lennon, whom she met in 1968, Green points out that the Japanese-born artist’s career neither began nor ended with her association with the ex-Beatle. Born in 1933 in Tokyo to wealthy parents, Ono moved with her family from Japan to Scarsdale, NY in the 1950s. That’s when she first started experimenting with poetry and composition. From the start, her work was often presented as instructions to her audience. That is one key factor setting Ono apart: Rather than filling the world with more objects, the way the typical artist does, Ono seeks to create an active, thought-provoking experience for the spectator. That might include inviting the viewer to climb a ladder in order to see the word “YES” through a magnifying glass. Or it could translate into actually cutting away part of Ono’s clothing as the artist herself sits placidly. Musically, Ono’s strange vocalizations have been compared to screams or shrieks. But, the video says, the sounds she made were inspired by the opera she had studied as a girl. Their pitch and volume, Ono attested, were meant to suggest urgency and desperation: “If you were drowning, you wouldn’t say, ’I’d like to be helped because I have just a moment to live.’” Along the way, especially through her writing, Ono has been an advocate for peace and feminism and has remained creatively active long after Lennon’s death in 1980. This video suggests that it is time to reassess Ono’s career and give her some credit for innovation and boldness.